attacks and strokes in the United State by 2017. They will achieve this goal by increasing awareness of your blood pressure. They want you to get it in control and to do so, you need to make it your goal. 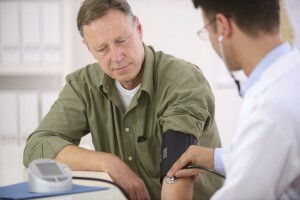 Currently 67 million Americans have high blood pressure. People with high blood pressure are 4 times more likely to die from a stroke and 3 times more likely to die from heart disease, compared to those with normal blood pressure*. work with your doctor to set a goal and a plan on how you can correct your blood pressure over time. Take your blood pressure medicine as directed. Be diligent on taking your mediation. Set daily reminders on your phone so that you take your medication at the same time each day. If you are having trouble taking your medicines on time or paying for your medicines, or if you are having side effects, ask your doctor for help. Quit smoking. Smoking causes many health issues so it is important that if you do smoke, you need to stop. If you don’t smoke, don’t start. Reduce sodium intake. Americans consume too much sodium. Check out our Facebook page during the month of February – we’re going to be sharing heart-healthy, lower-sodium recipes, meal plans, and helpful articles on heart health.